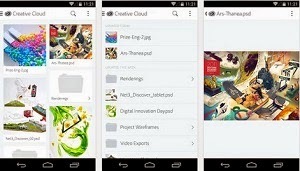 Adobe Creative Cloud APK, Adobe has recently released its creative cloud App thus allowing users to access and use the creative cloud services and apps right from their Android device. For now you'll not be getting all the series since the app is still in preview mode and the full features will be updated soon. This Creative cloud app lets you view your PSD, AI and other files stored in the cloud and you can sign-in with your Adobe id signup for the free account that provides 2GB of cloud storage and trail access to the Adobe creative cloud tools. You can download the App directly from Google Play or download and install the app using the APK file.